Built in Mediterranean Revival style in the 1920s, the Vinoy attracted a Gatsbyesque crowd before falling on hard times. It reopened in 1992 after extensive renovations, including the hand-painted pecky cypress beams and decorative plasterwork in its lobby and ballroom, which, along with the handsome Marchand's Bar and Grill, are on the National Register of Historic Places. The front of the hotel faces a marina on Tampa Bay and is just a short jaunt from Baywalk, an open-air entertainment complex of restaurants, shops, and movie theaters. But if you stroll out back, past the elevated swimming pool and its waterfalls, you'll come to the tennis pro shop and 12 Har-Tru courts, four of them atop a parking garage, the remaining eight handsomely landscaped with trees and shrubs. Hans Gallauer, a Wisconsonite whose long career started with All American Sports, runs a solid set of programs here, supported by his 400+ local members. Unlike other parts of Florida, St. Petersburg tends to attract younger families. "Our median age is probably 40+," he told me, adding "our membership is very, very active." And for guests who bring children, there's an after-school junior program that can readily accommodate their kids. The architectural details of the historic hotel aside, the attraction continues in a wide range of amenities, including a golf club (a few minutes away), spa, and full-service fitness center. And it doesn't hurt that St. Petersburg is home to the remarkable Salvador Dali Museum, and the largest collection of the Spanish Surrealist's works outside of Spain. Tennis director Hans Gallauer, who is originally from Wisconsin, took over here in the late 1990s after stints with private clubs and the once extensive camp program called All American Sports. A USPTA pro who began teaching in 1980, he has put in place a set of programs designed to meet the needs of some 400 local members as well as hotel guests. Activity is such that he and his three staff pros all keep busy. Tennis Staff. Tennis director Hans Gallauer, who is originally from Wisconsin, took over here in the late 1990s after stints with private clubs and All American Sports. 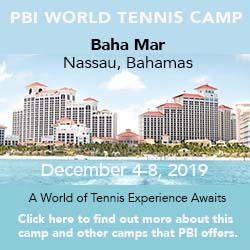 A USPTA pro who began teaching in 1980, he has put in place a set of programs designed to meet the needs of some 400 local members as well as hotel guests. Activity is such that he and his three staff pros all keep busy. Tennis Programs. Gallauer and his staff run a daily clinic (morning or evening depending on the day) geared to all levels and tailored to those who sign up. For hotel guests, they offer the crucial service of finding games, drawing on that large membership, while also feeding them into one of the two weekly round robins, monthly social (a mixed up round robin following by drinks and appetizers), or any other ongoing member programs they may be on hand for. "Our membership is very, very active," says Gallauer. "Their median age is probably the low 40s." In addition, from September to May they run an after-school junior program (ages 5-18), that the children of guests can take part in, while during the summer there is a Monday-Friday junior day camp, the latter for ages 5-12. Tennis is also a component of the resort's summer Kids Camp. Courts & Fees. The Vinoy has 12 Har-Tru courts all with lights and laid out in pairs with awning-covered patios between. Four are HydroGrid and located atop a parking garage; the remaining 8 extend in a line east toward Tampa Bay. This last group is well landscaped with trees and shrubs. Court fees: $20/90 minutes. Beach. None at the property. Since the hotel faces Tampa Bay, guests longing for a Gulf of Mexico-washed beach must travel across the peninsula to Fort Desoto in St. Petersburg Beach, 14 miles to the west. Golf Courses. Guests of the hotel have access to the otherwise private 18-hole Vinoy Golf Course, 1½ away. Length: 6,502 yards. Par: 72. Spa & Fitness Center. Massages, body scrubs, manicures, and pedicures and the like are available from the Vinoy Salon and Day Spa, while those looking to work out have access to a large, multi-room fitness center and its complimentary fitness classes. The resort has 360 rooms in all, 258 in the original building, another 102 in a tower to the east built in 1992. Although parts of the hotel are on the historic register, the rooms are not. Even those in the original structure were reconfigured to modern tastes in spaciousness and amenities, including doubles sinks in the bathroom vanities and high-speed Internet access (at $14.95/day). Light streams in from the clerestory windows in Marchand's Bar and Grill, an exceptionally handsome restaurant that serves breakfast, lunch, and dinner and whose dinner menu shows a Mediterranean influence. Alternatively, guests can have lunch or dinner, inside or out, at Alfresco's, next to the pool and steps from the tennis pro shop. Finally, there is Fred's, a steakhouse, the Clubhouse Restaurant at the golf course, and the Promenade Lounge and Coffee Bar in the hotel lobby. Travel Instructions. There are two nearby airports: Tampa International (TPA), which is 22 miles to the northeast, and St. Petersburg (PIE), 12 miles to the southeast. General Tourist Information. For information about the St. Petersburg area, visit the St. Petersburg/Clearwater Area Convention & Visitors Bureau website or contact them at 13805 58th Street N., Suite 2-200, Clearwater, FL 33760; phone 727-464-7200 or toll-free at 877-352-3224. Alternatively, check out the St. Petersburg section of the Visit Florida website. Here's what others have had to say about Vinoy Renaissance St. Petersburg Resort & Golf Club.